WIRA Lodra was a young and handsome man. He had supernatural power. Lots of girls liked him. And one of them was Putri Kedasih. She really loved him and had tried to persuade him to marry her. However, Wira Lodra rejected her love. He already loved a girl, her name was Darma Ayu. She was not just an ordinary girl. She was a goddess from heaven. She was so beautiful. Wira Lodra and Darma Ayu were in dilemma. All the gods and the goddesses did not approve the couple's relationship. "You know you cannot have a relationship with a human," said one god. "I know.. . but I really love him," said Darma Ayu. "Your relationship with a human has made you sinned. You have to purify yourself from the sin," said one goddess. "What should I do?" asked Darma Ayu. "We will put you in one place. There you have to lead the people. You will become their queen. And after the people live prosperously, you can go back to heaven." Darma Ayu was sad. She really loved Wira Lodra although she knew it was wrong. Then the gods and goddess put Darma Ayu in the riverside of Cimanuk River. There she became a queen. She led the people wisely. Slowly more and more people came. The people were prosperous. Meanwhile, Wira Lodra was looking for Darma Ayu everywhere. He really lost her. And when he heard that lots of people lived in the sides of Cimanuk River, he went there. He heard that the place was led a by a very beautiful woman. She hoped that woman was Darma Ayu. And he was right! The woman was Darma Ayu. The couple finally met again. They were really happy, And this time Darma Ayu forgot her punishment. She just wanted to live with Wira Lodra. They would get married. However, before the marriage started, something happened. Putri Kedasih, the woman who really loved Wira Lodra, came. Apparently she still loved him although Wira Lodra had already rejected her. She came and told Darma Ayu that Wira Lodra was her husband. She pointed her big belly. Well, it was just a lie. She pretended to be pregnant just to make Darma Ayu angry. "Wira Lodra is my husband. Look, I'm pregnant. He is the father of my baby," said Putri Kedasih. She succeeded. Darma Ayu was so angry. "You said that you really love me. But why did you marry someone else?" asked Darma Ayu. She was so sad that she left Wira Lodra. She came back to heaven. "No, please, don't leave me.... I still love you. I never marry her. Please come back to me!" cried Wira Lodra. Wira Lodra was so sad. And he was also very angry at Putri Kedasih. He asked her to leave and stay away from him forever. Indramayu Regency is a regency (kabupaten) of West Java, Indonesia. 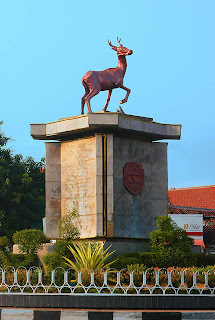 Indramayu is its capital. This regency is located on the northeastern part of West Java.